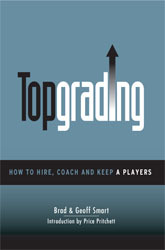 I've had the opportunity to become a student of the "Topgrading" methodology for talent management. I've worked with Brad Smart to implement his hiring system within one of our sales divisions, and we're already to see remarkable results. I'd highly recommend visiting his website to learn more: http://www.smarttopgrading.com/index.cfm. Having assessed and coached 6,500 senior managers, my experience tells me you should ignore the common “wisdom” that people should just work to keep their strengths rather than to try to fix their weaknesses. An article in the November, 2007 issue of Training and Development (“The Positive Payoff”) conveys that common viewpoint. It sounds sensible for the world-class miler to run miles and not to try to convert to an event he’d hate and fail at – pole vaulting. Trouble is, management is like the decathlon, with a lot of “events,” and if someone is strong in 8 events but weak in 2, that person will not succeed if competitors are strong in all 10. Management requires a lot of skills, many of which are necessary, not just desirable. I’ve sat in on a thousand meetings in which managers were considered for promotion, and the people who get promotions of course have many strengths. However, the most important consideration almost always is that they have no “fatal flaws,” “derailers,” or serious weak points. My role as a coach is much more to help managers fix one or two serious weaknesses than to help them maximize their strengths. For management jobs, my experience is that high performers who want to earn promotions quite naturally maximize their strengths every day. They know they are great at product launch projects, public speaking, analysis of financial reports (or whatever); they love exercising their strengths, read articles and go to seminars to strengthen them, and too often ignore working on one or two competencies they must have in order to get promoted. In my book I break out 50 competencies into groups including competencies that can be significantly improved on in one year (personal organization, writing, and even treating people with respect), and those competencies that generally can’t be improved on a lot (honesty, drive/energy). Actually, for individual contributors, which are most people in companies, I totally agree that they ought to stick with their strengths and what they love to do, and not waste time trying to fix weaknesses that have no bearing on their success or job satisfaction. The creative ad person is probably better off staying in marketing than maybe trying to make more money by transitioning into an accounting job that would be boring. But as soon as people move into the world of management, and particularly when they want to be promoted two or three levels – aha, that’s where all those meetings I’ve been in make it clear that weaknesses knock people out of promotions all the time! That’s where the decathlon analogy is quite real! I am frequently asked about the value of working on fixing weaknesses and make the point: for individual contributors, don’t bother trying to fix your weaknesses and instead go with your strengths, but for ambitious managers, fix your serious weakness(es) or your career will plateau!